Established back in the late 80s by the talented Anavel Caparros, Caparros is a luxury footwear label renowned for its elegant and feminine aesthetic, bold metallic details and delicate crystal embellishments. Coveted all-over the globe by style-conscious individuals, this brand will be sure to add an instant touch of sophistication to your look. 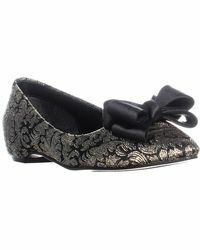 Caparros' range of women's flats is easy-to-wear and seriously sleek. From romantic bow detailing to dazzling metallic princess flats, pair these shoes with skinny jeans and an oversized top for nonchalant style.